I am way short of my very optimistic goal of 3,500 coins for the year; decided to see how many coins I could retrieve in a month without dedicating whole days to the task. I would use free time that might be wasted lounging, or watching TV. The key for me was finding areas with high coin density. Most of the places that seem like they will be great turn out not to have much at all. 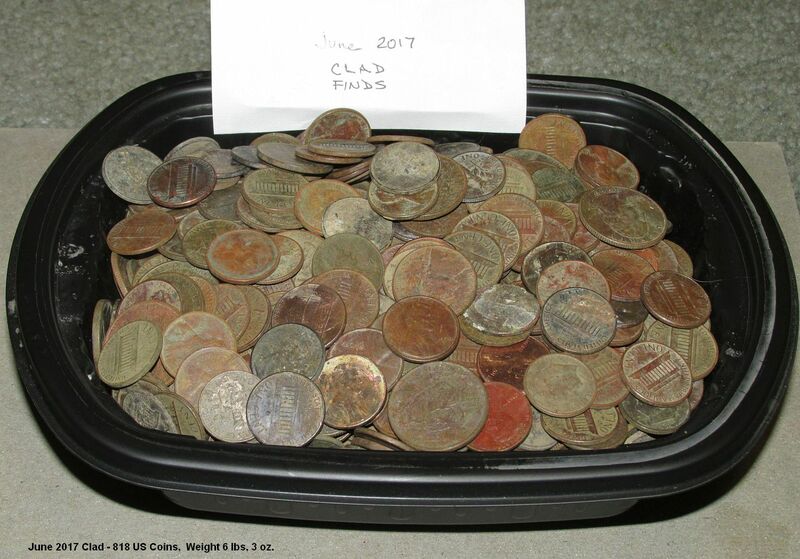 I worked some open field areas in parks, and school yards searching for "hot spots" where people played games or sat in the grass.. Also, I stumbled upon a metered parking area, with sod along the curbs, that contained a very high density of coins, mostly cents, but a substantial amount of dimes and quarters as well. Also, a school that was very unproductive in all the usual places gave up 71 coins in less than two hours, from an area about 5 feet by 15 feet between the sidewalk and a building wall, which I believe was in the past a staff smoking spot. 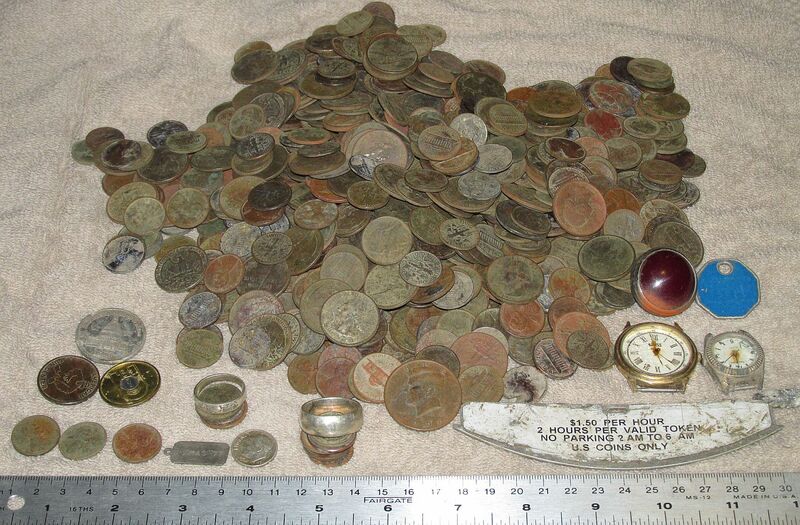 Only about a half dozen other coins were found at that building. It had been well hunted everywhere but that smoking spot. For the month of June I hunted on 22 days with an estimated hunting time of 42 hours, based on my log record. The longest hunt was about 3 hours; shortest about a half hour. For the last three weeks of June I hunted only with a 5" coil on my F75, and used a probe to retrieve about 95% of the targets. Avg. hunt time 1.9 hrs. This is by far the most clad I’ve ever recovered in a month. Coin count correction from May. All the May clad has been tumbled and cleaned. 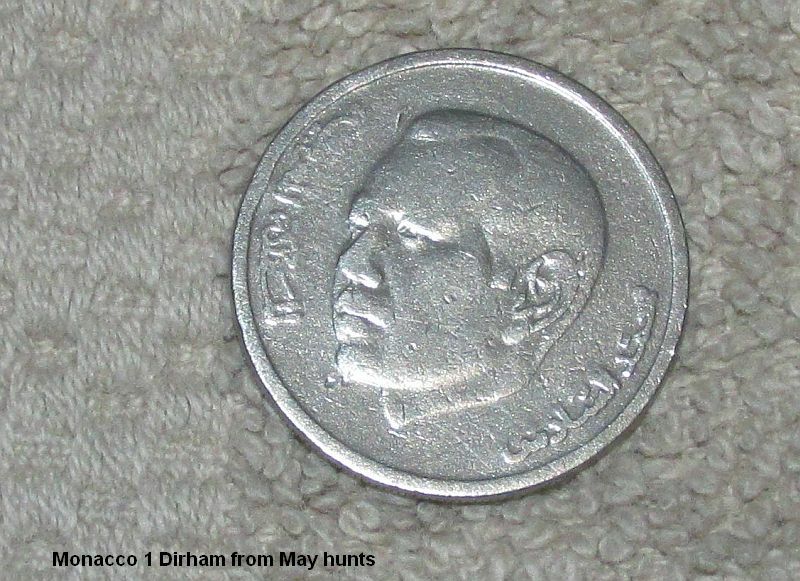 One of the coins counted as a Washington quarter turned out to be a Moroccan 1 dirham coin. The size is virtually the same as a US quarter with similar composition. The red surface oxidation had obscured the features enough that I misidentified it. Hard to believe when you see it cleaned that it could be mistaken for George Washington. So in May, I dug both a coin from Yemen and a coin from Morocco in central Michigan. What are the odds of that? Photo of the false Washington below. 001 x .10 Roosevelt Silver dime (1964) first silver coin of the year. I am way behind! 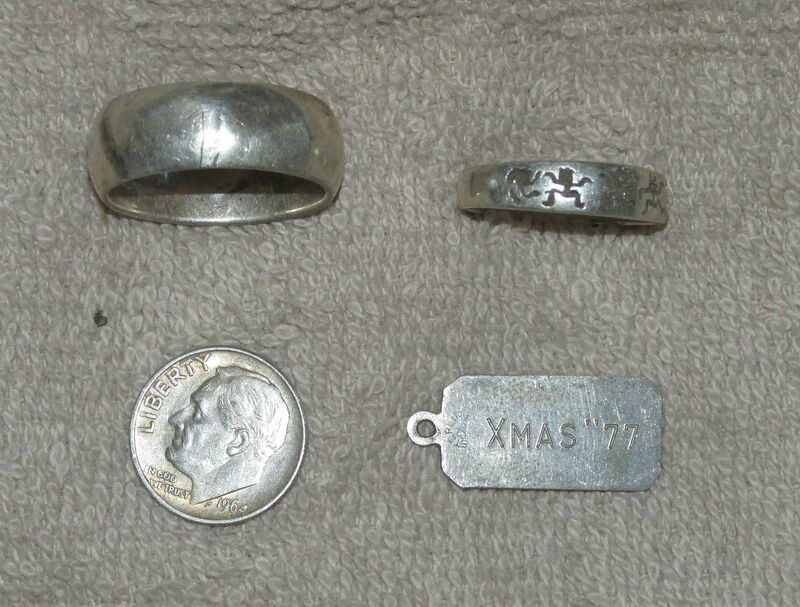 Two sterling silver rings; one sterling silver “Christmas ‘77" charm; Misc. Tokens and 3 junk watches.